Advertising your Business in the Frankfort Park District brochure it is a great opportunity for merchants in Frankfort and surrounding communities to promote your business with direct mailing. It helps offset the costs of printing the brochure and is a way to support the parks and recreation programs in your area. 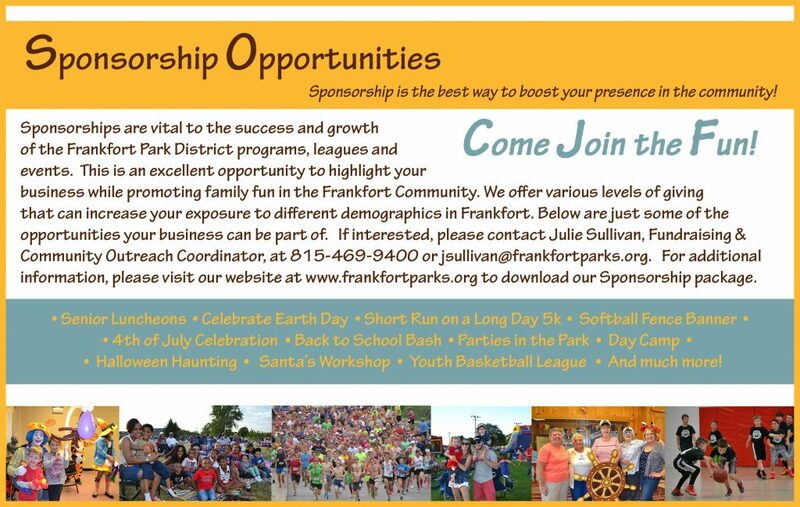 Why advertise in the Frankfort Park District seasonal brochure? This is our #1 marketing tool to promote our programs, events, leagues and services that are offered to our patrons. 9,250 brochures are printed each season. From the 9,250, around 8,900 are delivered to Frankfort residents. The additional brochures are distributed through Park District facilities and community-wide events. The brochure is also available on our website for increased visibility. Builds good will and community awareness. We offer design services at a minimal cost. To simply make a financial contribution to support the work of the Frankfort Park District in securing open space and enhancing recreational opportunities in Frankfort, please stop in or mail a check to the Frankfort Park District located at 140 Oak Street in Frankfort, 60423. The Frankfort Park District is proud to continue a Memorial Tree Program to plant trees in parks for all Frankfort residents to enjoy. Through this program, you can honor or remember a person, an event or an organization by having a tree planted in their name. A tree can be given to celebrate someone’s birthday, to memorialize a deceased family member/friend, commemorate a special event in your life or recognize an organization and its accomplishments. A donation of $350 will purchase a tree in a park designated by the donor or honoree and approved by the Park District. Trees will be planted in the spring and fall each year. In addition, the year, along with the name of the person, event or organization being honored, will be proudly displayed on a Plaque at the base of the tree. This program benefits the community as a whole, and the tree can be enjoyed for years to come. Tree choices include: Red Sunset Maple, Autumn Blaze Maple, Sugar Maple, Red Oak, White or Pink Flowering Crab Apple, American Linden, and Chanticleer Pear. 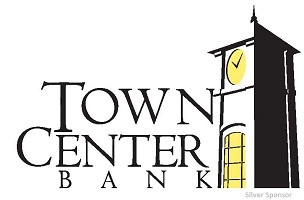 The Frankfort Park District also offers patrons an opportunity to honor or memorialize a person, event or organization by purchasing a beautiful, high quality 6-foot park bench for placement along a Frankfort Park District park walkway or near a playground (requested location must be suitable for bench placement and approved by the Park District). A $1000 donation will include the bench and a memorial plaque, which will be mounted on the bench back. Stop by the Founders Community Center for additional information and to see a sample of the bench in the entrance hallway. Operation Playground is the 501C-3 charitable foundation that supports the Frankfort Park District by raising funds and building additional amenities in the Frankfort park system. Several years ago, Operation Playground installed a picket fence at Fort Frankfort that not only provides safety and security for our children, but also offers the community a way to remember or honor a loved one or organization. For a $50 donation, you can have your name or a name you choose engraved on one of the wooden pickets in the fence surrounding Fort Frankfort. This is an opportunity to become a part of this amazing play space that was designed and built by volunteers in the community. Years from now your children and grandchildren will enjoy searching for your family names and will remember that you were part of this community event. Engraving is limited to 17 characters per picket. Picket purchase requests can be mailed to Operation Playground, P.O. Box 1044, Frankfort, IL 60423, along with a $50.00 check payable to Operation Playground Inc. This group also sponsored the creation of the Frankfort Bark Park at Commissioners Park, which opened in May 2007. Fundraising is an ongoing effort to continually enhance the amenities available for our four legged friends. Click here for more information.